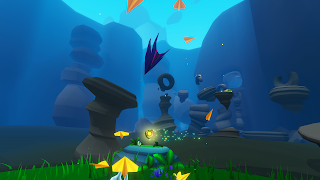 This initially simplistic VR game quickly became something I enjoyed playing immensely and wanted to keep playing through to improve my accuracy. 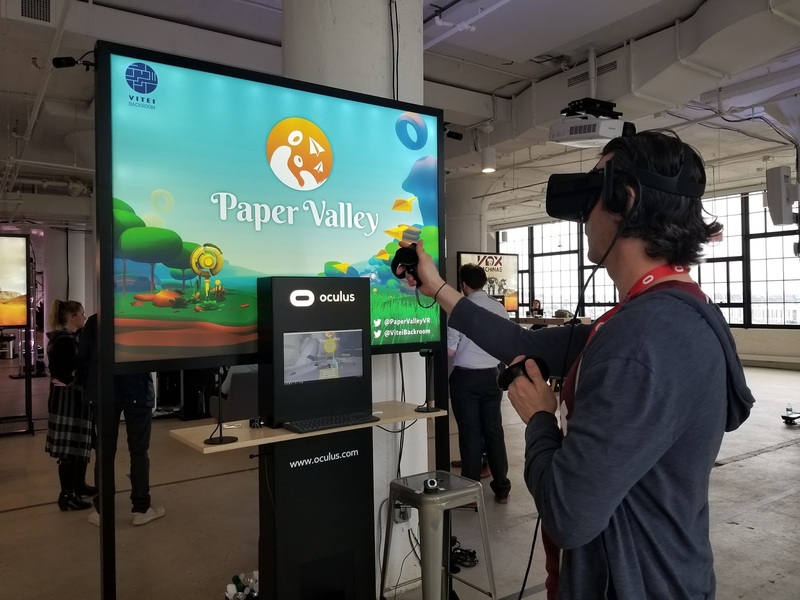 Paper Valley offers a nonviolent, zen-like adventure that anyone who has ever thrown a paper airplane can enjoy. Accessible controls offer a simplistic and relaxing experience. The core concept of the game has you grabbing and throwing paper airplanes of different types at targets or teleport stations in order to move through the beautiful levels. There is some subtle layers of strategy to learn how to throw and steer the airplanes effectively. The music is beautiful and atmospheric and really brought me into a calm place while playing. 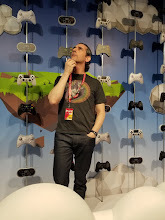 In speaking to the creative developer he wanted to make a game that is fun to play, but he also wanted to use VR to make an art like experience for people to enjoy. In playing the game I can safely say he succeeded. The world is stunning with a joyful look and feel and the music accompanies the gameplay in a way that just works. 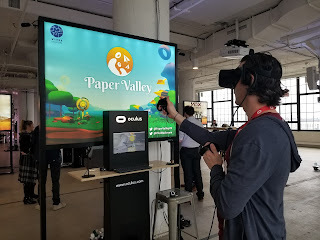 Paper Valley is a different type of VR experience but one I greatly enjoyed. Blind was another original concept game I was able to experience at the Oculus VR Game Day. In this title you are in a mysterious car crash and wake up in a strange place with no vision and your brother is missing. You discover quickly that the only way to see is through echolocation--where sounds become images. Travelling through the house she woke up in your character has to solve puzzles using echolocation and a cane to hit surfaces which triggers a look at the surroundings. It is obviously hard to explain this way, but in action the game is really effective. Navigating while tapping the cane to 'see' the surroundings is a very cool thing to experience in VR. The game is all about exploration and puzzle solving in a narrative driven experience. There are some shocks and creepy elements which I enjoyed as I went through the demo. Sound and visual cues imparted by the echolocation are crucial and that is benefited by the full audio and VR immersion offered by the Oculus Rift setup. Following up on the hugely successful game Job Simulator comes the more relaxing Vacation Simulator. In this title you are on a vacation paradise hosted by various robots who want to help you make the most of your tropical paradise. In the demo I played there were tons of activities and challenges that were immersive and fun thanks to the full VR setup the Rift offers. I was able to play soccer, hunt for parts for a robot, do a Yoga workout and toss around a beach ball. Navigation was easy and looking all around the bright and colorful beachfront was fun and actually relaxing. The game is not deep at all and that is the point. The goal of Vacation Simulator, is well to make you think you are on a fun action filled vacation. It was nice to experience a title like this and Paper Valley covered above as many VR games try to put you in a full heavy sim that makes you feel like you need to be aggressive and action oriented. These titles are nice ways to relax in VR and just enjoy the experience. Looking forward to checking out more of this game once it releases later in the year.